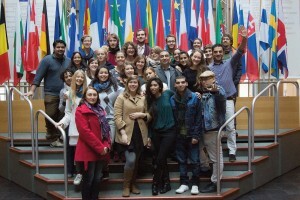 Phiren Amenca is a network of Roma and non-Roma volunteering organizations that organized, in cooperation with VISA L’Année Diaconalé as partner organization from France, the fall seminar of 2014 in Strasbourg. 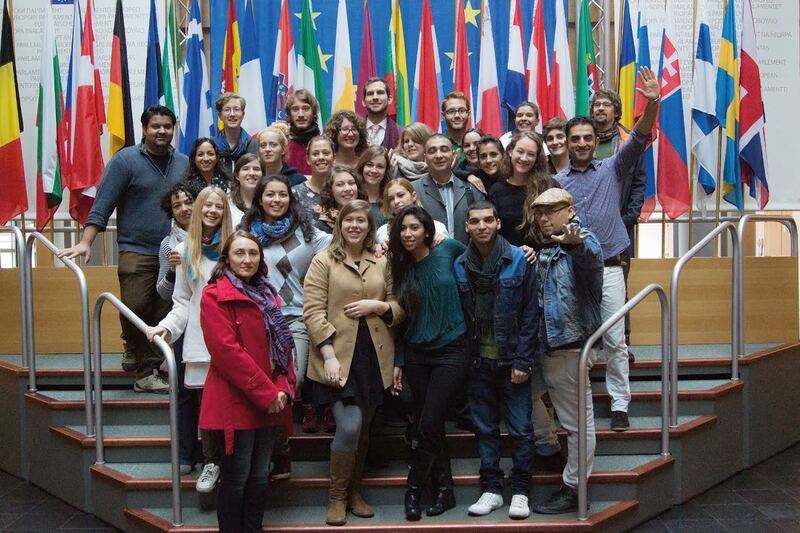 40 Roma and non-Roma youth leaders and youth activists from all around Europe gathered for 6 days in Strasbourg, France. This seminar was an opportunity for multipliers and young activists to create a platform of exchange of experiences, practices and methods for young people and youth organizations how to address migration, antigypsyism and human rights issues in grassroots, national and international youth actions and how to strengthen the awareness and mobilization of young people for these issues. The seminar was designed to share experiences between the participating organizations, to increase knowledge and awareness of participants on migration, to reflect about the effects of migration on the human rights of young Roma, and to understand the challenges and potentials of youth work and non-formal education. The seminar was designed mainly for using non-formal tools for Human Rights Education. Non-formal education is a valuable tool for Phiren Amenca’s network in challenging antigypsyism and stereotypes. The methods we used included role games, working groups, sessions on sharing and mapping realities, meetings with local Roma activists and we were visiting the European institutions (European Parliament and Council of Europe). Participants had the opportunity to share personal experiences, bring stories, photos, videos, and other materials to share personal engagement and experiences as young Roma. Through this project we aimed to increase the awareness of young Roma and non-Roma multipliers about the issue of migration and human rights, about their role and responsibility within their own communities. Talking about Roma & Migration, sharing concrete cases and stories from our local realities aimed to raise awareness about the reality we live in. We had some cultural contribution as well as a good opportunity for networking developing relationship for the future as young activist. The first workshop, starting with the history of Roma. It was presented by Vicente Rodrigues talking about the history we all should know about in order to express an opinion. That’s how we learned that since 1685 Roma were deported from Portugal to Brasil, because speaking Romani was a crime. The Austro-Hungarian Empire Karl VI ordered the extermination of Roma in 1721. Further, 1749 is the year of the “Great Gypsy Round-Up’’ when Gitanos (Roma from Spain) are separated and as punishment they need to offer forced public work. Those who dared to escape are hanged, orphan girls are sent into service to “honest’’ people, wives of sentenced men are sent in factories as slaves and educated in Catholic doctrine. In 1880 Argentina forbids Roma to enter the country. The history of migration and expulsion continues till today. During the workshop held by Esteban Acuna we worked on real cases for a better understanding of the reality which is around us when we are talking about Roma. About their possibilities as Roma and their survival in a society that treats Roma based on stereotypes and racism. As a consequence of migration, the situation of Roma has meanwhile become a topic in the member states of the EU. At the same time, the actions of individual governments stand in contradiction to the self-proclaimed values of the Union such as freedom, equality, and respect for human rights. In their countries of origin, Roma are excluded, increasingly becoming objects of hostility, and live in extreme poverty and permanent segregation. There is one story I would like to share to make it more clear what is all about migration. It is about the story of A.A, whose life story begins in a small village in Hungary. There are not many opportunities in a small village so they have moved from a village to the city. At that moment the world have just opened up to him! His mother worked in a factory and she was the main support for the whole family. She raised her kids to be ambitious and sent kids to school to get educated. School wasn’t an easy place and it wasn’t about learning and hard work in order to achieve knowledge. Kids were treated him badly, but he didn’t understood why, because he didn’t know what racism is all about. Mother never talked about it because she wanted to protect them! He didn’t find out from the family the meaning of being Roma but he found out later on. When he was 14 he met his wife and had a son. He left school and started to work in a factory in order to be able to support his family. So, life started! He always knew that if someone were needed to be fired, he would be first because he is Roma. So they continuously had to move to a new place. They settle down for a while in Rome, find a job there but they had to leave again because there were several attacks, three times in front of his family. The situation became unbearable! They decided to go to Belgium where his brother was but another attack happened, they where beaten, even his child! They moved forward, they went to Brussels! Not being eligible for asylum inside the EU, several months later they followed his brother again into Canada. After a long flight they were questioned by an immigrant officer. During the questioning he heard the officer saying something such as “damn it, one more refugee family!’’ But the fortune smiled to him, finally! He was able to get a lawyer provided by Toronto’s Roma Community Centre where he later became an active member. So, finally nightmare was over, his family was been finally accepted in Canada as refugee! Non-formal education is an important education tool for us! In this event we made a set up for a new methodology! Our new working tool for education is LARP – Living Acting Role Play. We used a scenario about a imaginary migrant family that some members of our team invented before. We think is important to implement something new and to try it on different groups because this is the way we can develop a new tool to achieve goals with. Participants were divided into two groups having the same scenario. Every participant had a character that they had to represent as it was written in the scenario. They had to respect the characteristics of their character but not the actions. Instead they had to improvise! An interesting moment occurred when some of the participants identified themselves with the migrant character because “it is just like being Roma in our days’’ one of the participant said. LARP was meant to build strong connections between participants to put them in the context where the character they represent is the ,,unwanted migrant’’ to understand the difficulties of being an immigrant and to fight for their own integration into a new society. This study session was a successful because the usage of informal education empowered the participants and raised awareness. The topics of Roma, migration and human rights were successfully connected. The participants were given the chance of having an insight view into the fields of activism and academics by expert input presentations. A safe environment was created which allowed to the participants to share their personal experiences on migration and human right violations. Also the seminar gave the possibility to work on follow-ups, to connect European youth leaders and activists and enabled the creation of new projects. Like for example the European Youth Event in Summer 2015 in Cluj the European Youth Capital and the X – Chavalem Youth Exchange on Pop culture and Science-fiction.